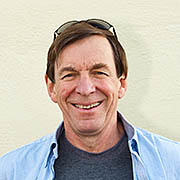 John Hart is the author of several books, including Storm over Mono: The Mono Lake Battle and the California Water Future (California, 1996) and Farming on the Edge: Saving Family Farms in Marin County, California (California, 1992), both of which won the Commonwealth Club Silver Medal. He is also a prize-winning poet whose book The Climbers is part of the Pitt Poetry Series. John also works as an editorial consultant on public involvement documents and reports in the planning and environmental fields. David Sanger is an outdoors and travel photographer based in the San Francisco Bay Area. He is a regular contributor to Sunset, Via, Caribbean Travel and Life, Endless Vacation and numerous other magazines as well as to Insight and Fodor’s Guides. Among his corporate clients are the National Park Service, Bank of America, and tourist boards in the Caribbean and the South Pacific. He was selected by the Golden Gate National Park Association to document the recent Crissy Field restoration.